ACCESSORIES // Tania Maras 'Le Jardin' Collection — Love Find Co. 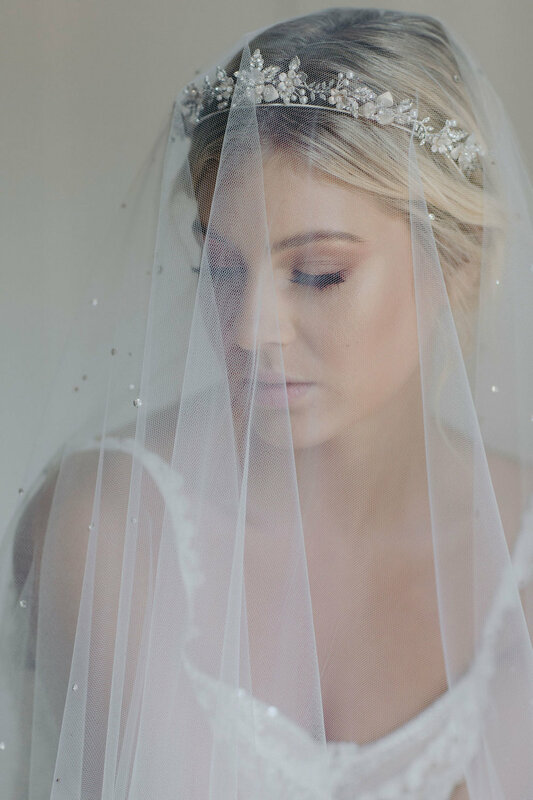 Bridal Accessories designer Tania Maras has created a dreamy, romantic and utterly beautiful hair accessories and bridal veil collection titled 'Le Jardin’. Canberra based, Tania Maras founded her eponymous line with a romantic spirit and a pursuit to offer the contemporary bride custom bridal accessories that capture their unique style and sensibility. She is inspired by the woman behind the bride and seeks to design pieces that will be treasured and worn in the most beautiful way. 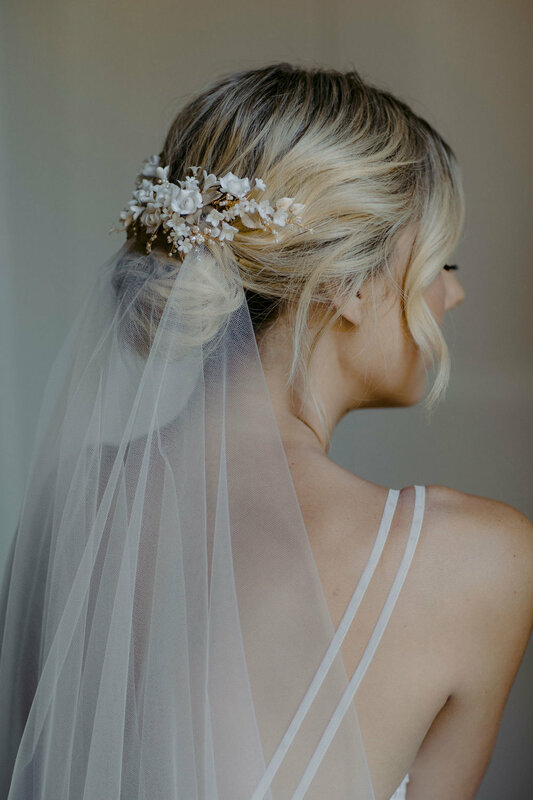 The floral details styled with floaty tulle veils will make any bride swoon for the perfect accessory for their wedding dress. Explore the collection below. A dreamy display of romanticism, the Cashmere wedding tiara is softly embellished with floral motifs of muted mushroom and antique silver tones. Accented with Swarovski crystals, we love to pair this piece of regal splendour with a crystal veil for a look that’s utterly majestic and breathtaking. A beautifully balanced bridal tiara with classic appeal, the Clarabel is graceful and effortlessly elegant. It’s the perfect finishing touch for modern romantics and brides who know their own style. Pair this headpiece with a sleek and dramatic cathedral veil that commands attention like the Georgette. The Georgette classic cathedral veil elegantly elongates the silhouette and frames most wedding gowns and trains in the most flattering way. 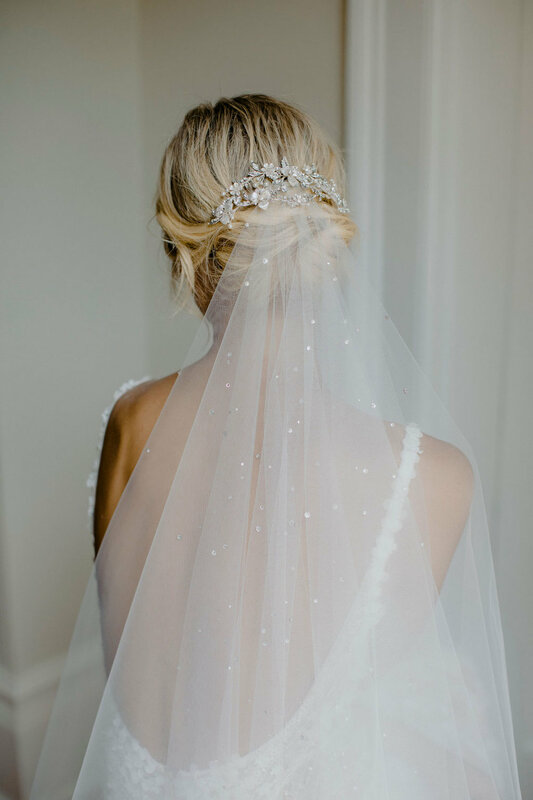 It’s the perfect veil if you want movement, simplicity and regal appeal. Textural applique adorn this stunning sheer fingertip veil. Inspired by the majestic Weeping Cherry tree, the detailed floral accents still feel airy, whimsical and romantic. Designed for the bride who craves a touch of drama and femininity to finish her bridal look. The cropped silhouette frames ballgown skirts and sheath dresses in a way that feels floaty and romantic. A perfect choice for a bride seeking an embellished and dramatic veil without the length. An ethereal beauty of rich harmonic layers, the Evening crystal headpiece is hauntingly beautiful and decadent on every level. The colour palette of soft silver, antique silver and mushroom tones has been artfully arranged to frame a low set updo. Offset the decadent details with a sheer drop veil with scattered crystal elements, such as our Morning Mist veil. Our favourite combination for luxe bridal style. This dreamy palette of soft champagne, pale gold and blush tones was inspired by the softness of light upon delicate cherry blossoms. 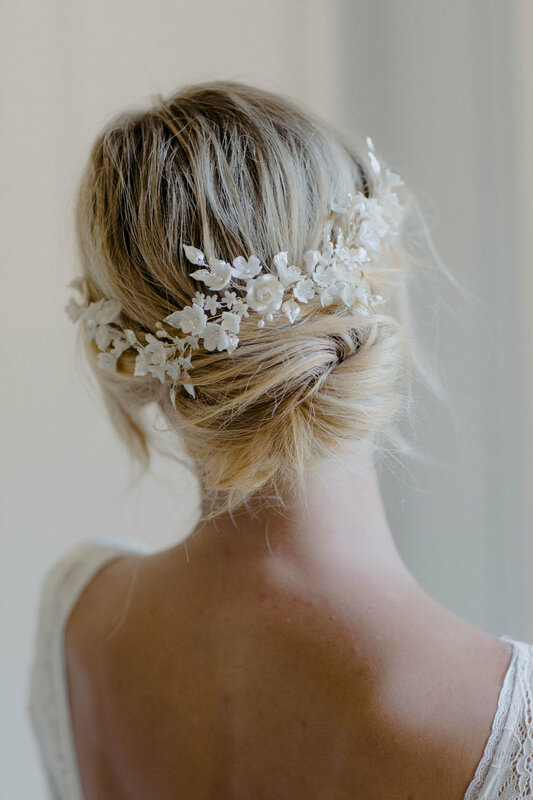 A floral display bursting with overgrown details, this set of hair pieces feel feminine, fresh and utterly romantic. The ombre blush tones are harmoniously balanced by the soft champagne detailing, creating a soft feminine look like no other. A headpiece inspired by an untamed garden abundant in bursting botanicals and texture. The Gardenia headpiece creates a crown-like effect in the hair that enhances a bridal or half up hairstyle with its elongated design and textured opulent details. The heavily floral details elevate a traditional hair vine in a way that feels romantic and sophisticated. Inspired by the grandeur of an enchanted garden, this bridal tiara comb is utterly enchanting. A headpiece for a bride with a love for the traditional, it’s designed to be worn high on the head to frame the face and finish a full and frothy wedding veil. The Amora veil is characterised by a classic raw edge which creates a sleek, chic effect with a nod to the traditional. This utterly romantic bridal hair comb embodies our enduring love for Mother Nature. It features bud-like pearl elements nestled amongst sculptural blooms. These details create a beautiful focal point in the hair without taking away from the beauty of a wedding dress. It’s the perfect piece for brides inspired by bohemian luxe bridal styling.